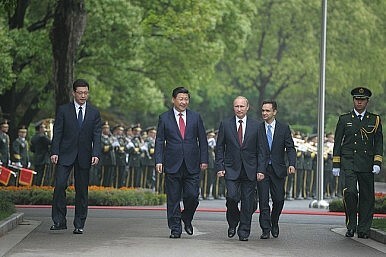 What Should the US Do About Closer Sino-Russian Ties? Why Washington should resist the temptation to overreact to their growing convergence. The splashy announcement recently of a $400 billion deal that will send Russian natural gas to China has triggered a new wave of speculation over the implications of strengthened Sino-Russian ties for America’s strategic position. The supply agreement, which will give Beijing a much-needed source of clean energy and Moscow an alternative market as relations with Europe have soured in the wake of the crisis over Ukraine, fleshes out a “strategic partnership” that has flourished over the past 20 years as a result of expanded trade, the final resolution of all border disputes, and a shared interest in impeding U.S. hegemony. For some alarmed Western observers, seemingly forgetful that not even the bonds of communist ideology could prevent the violent rupture of the Sino-Soviet alliance at the height of the Cold War, this invigorated relationship threatens to consolidate into an anti-American alliance that is headed toward an eventual clash with the U.S. More sober voices stop short of such grim forecasts, but counsel that Washington should devise policies aimed at driving the two powers apart. How, if at all, is the U.S. likely to respond? Any assessment of U.S. options for responding to growing Sino-Russian convergence needs to begin with an understanding that the post-Cold War reconciliation, burdened by a long history of distrust, has often fallen short of the flowery rhetoric of summit communiques. For both sides, the relationship remains a function of more important dealings with the United States. While shared antagonism toward America can make for strange bedfellows, neither Moscow nor Beijing is willing to sacrifice its own agenda with Washington for the sake of this liaison. Sharp disagreement over relations with the Americans has historically divided the two powers. The Sino-Soviet schism of the late 1950s resulted in part from Nikita Khrushchev’s fear that Mao Zedong’s adventurism threatened to drag the U.S.S.R. into a major conflict that would derail détente with the U.S., a project that Mao, in turn, believed would come at the expense of China’s own interests. This dynamic is still alive today. Russia would be no more willing to take sides in a potential Sino-American crisis over Taiwan or the Senkaku/Diaoyu islands than the Chinese were eager to offer diplomatic support to the Russians during the Georgian war in 2008 or the recent standoff over Crimea. Since his return to the presidency in 2012, Vladimir Putin has brazenly acted to resist what he sees as Western encroachment in Russia’s politics and sphere of influence on its frontiers. Yet the Kremlin’s interest in advancing a counter-terrorism and non-proliferation agenda, as well as an overarching preoccupation with being accorded the respect of a great power, necessitates sustained interaction with the U.S.
Like his Russian counterpart, Chinese President Xi Jinping has ridden a popular wave of nationalism, which has manifested itself in a vigorous assertion of various sovereignty claims in the South and East China Seas. In his repeated reference to “a new type of relationship between major countries,” however, Xi has signaled the need for mutual self-restraint in Sino-American relations to avoid the type of conflict that has traditionally accompanied power transitions between rising and established states. Economic interdependence with America also limits the extent to which China can confront the U.S. without harming itself. Even though Sino-Russian ties are not as warm as either claims, the U.S. today does not have the strategic flexibility of 40 years ago, when Beijing and Moscow regarded the other as its most threatening adversary, to drive a wedge between them. Mutual opposition to how Washington throws its weight around the world has created a basis for sustained cooperation between former rivals. The Obama administration’s rebalancing of diplomatic, economic and military assets across the Pacific to contend with an ascendant China, even as it unfolds unevenly, feeds Beijing’s fears of U.S. encirclement. America’s championing of democracy in the Middle East and among the former Soviet republics is viewed by Russian officials as a fig leaf for installing governments sympathetic to the U.S. For both China and Russia, then, greater coordination is a source of vital strategic leverage against the Americans. In the prevailing strategic climate for the U.S., the concessions necessary to entice either Beijing or Moscow to back away from the other would probably outweigh the potential payoff. America’s uncertain economic recovery, debilitating political divisions and pursuit of modified retrenchment in the Middle East, as evidenced by the pursuit of a negotiated resolution to Iran’s nuclear program and aversion to entanglement in Syria, have raised questions of the country’s capacity for honoring its far-flung security commitments. Both Putin’s land grab in Crimea and Xi’s saber rattling in bordering waters have likely been encouraged in part by the sense that the U.S. is too hobbled by resource constraints and strategic overstretch to mount an effective response. Extending olive branches to either party in the immediate future runs the risk of cementing impressions of American declinism and encouraging further risk-taking behavior, an outcome to which the Obama administration and its successor, which can be expected to be less circumspect in the exercise of U.S. power, will be sensitive. Any American attempt to foment a Sino-Russian split by wooing either Beijing or Moscow would also be resisted by Asian or European allies, who are already fearful of a U.S. retreat from its global responsibilities. Indeed, the demands of alliance management will likely preclude any elaborate triangular diplomacy with China and Russia. The U.S. confronts a complex, contradictory strategic challenge in both Asia and Eastern Europe, one defined at once by sustained doubts among its partners of America’s staying power and impressions of U.S. hostility harbored by China and Russia, respectively; the anxieties of one side cannot be satisfactorily addressed without heightening the suspicions of the other. Whether this fine line can be straddled indefinitely is doubtful, as Washington will find it increasingly difficult to resist the pressure to bolster confidence in America’s fealty to its defense commitments among its allies, whose allegiance to U.S. leadership is vital to the country’s global standing. There are already signs that the Obama administration has seen fit to pursue a course aimed at discouraging China’s bullying of its neighbors and isolating Russia. A combative narrative that has taken hold among Republicans and liberal internationalist factions in the Democratic Party alike, one that sees Obama’s strategic caution as eroding U.S. credibility and inviting aggression from China and Russia, will reinforce this shift to a more assertive stance toward both Beijing and Moscow. A decision to forego grand Kissingerian schemes of fostering Sino-Russian tensions need not redound to America’s disadvantage. Mounting such an effort, in light of heightened suspicions of U.S. intentions, could very well backfire and result in greater coordination between the two powers to guard against Washington’s meddling. Resisting the temptation to overreact to enhanced cooperation between Beijing and Moscow, coupled with initiatives aimed at muting the more corrosive elements of America’s strategic competition with both China and Russia by exploring cooperation on issues where interests overlap, may prove more effective in allowing existing fault lines between the neighbors to widen naturally. This uneasy pairing will be subjected to new strains as an economic and military imbalance already favoring China becomes more pronounced over time. As China’s self-confidence grows, it may be less inclined to consider the sensitivities of a proud, prickly Russia. Already sensitive to Beijing’s growing sway over the former Soviet republics in Central Asia and to its own fragile hold on Siberia and the Russian Far East as a result of steady Chinese migration, the Kremlin will likely chafe at being reduced to junior partner of a dynamic neighbor with which it shares a long history of conflict. By simply letting this dynamic play out, the U.S. may discover that maintaining a relatively aloof posture toward the Sino-Russian relationship is its best option for regaining much needed strategic leverage. Michael Lumbers is author of Piercing the Bamboo Curtain: Tentative Bridge Building to China During the Johnson Years and a senior analyst at Wikistrat.